I have a couple of students whose hands “float” off the tabletop (ulnar side of hand is not in contact with tabletop). They tend to write with shoulder/elbow movements. If I make them keep their hand on table, they then use wrist rather that finger excursion movements. What do you recommend to help correct this?? More wrist work?? Finger mobility excursion work?? I though I’d share our conversation and the ideas that I have found to work in this situation. Our time with students is precious and there’s always so much to do. I’ve found that a schedule of activities helps me to keep on task and accomplish the goals that we’ve set for that session. Also, a written or visual schedule helps the student follow and understand what his or her work will be for that day. In the case of “floating hands,” I typically follow a strict schedule of tasks that will help both me and the student recognize progress and to uncover continued needs. Begin the session with gross motor work. Although the students are using their shoulders to manipulate the pencil and negotiate the task, that doesn’t mean that they have strong upper body and/or core strength. In fact, it could mean the opposite. It takes strong muscles in those areas to maintain the arm and wrist positioning needed for a fluid and legible handwriting style. Writers who use their shoulders and elbows in this way often benefit from lots of upper body and core strengthening activities. I’d suggest starting each session with 10-15 minutes of upper body workouts: wheelbarrow races; wall pushups; yoga exercises such as the the plank and the warrior; and floor pushups if they are strong enough. I even work on arm wrestling at the table. Of course, be careful – lots of these students can take you down on that one! In the same session, I’d move on to vertical activities. 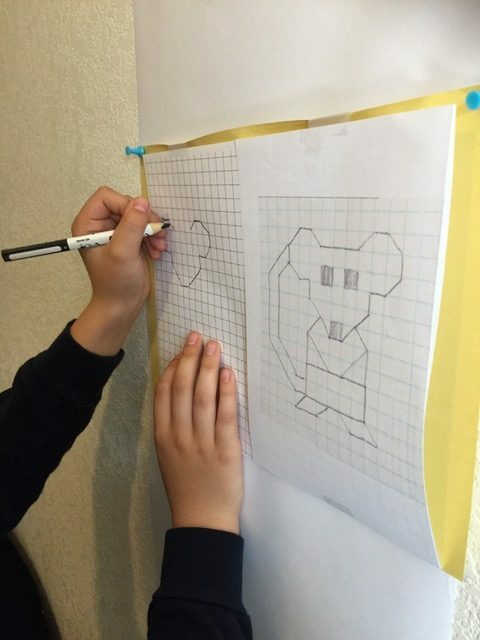 These can be completed on papers taped to the wall or white board (but not completed with marker on the whiteboard, please*), a window pane, or an easel. The activities I provide include drawing, doodling, word search, crossword puzzles, coloring, tracing, or any type of activity that places the wrist in the slightly extended position that is preferable for handwriting at the desk. I usually take my students through another 10-15 minutes of this, making sure that I explain why the wrist needs to be placed just so and why it is important not to lean on the forearm to steady oneself or to rest against the wall. The arm and hand need to move fluidly as they do while producing handwritten work at the desk. During this segment of the session, I will provide the students with a break periodically to give the upper extremity a rest. For example, after each 5-minute span, I offer a break that might include playing an ongoing game such as Operation, blowing a cotton ball across the table or floor at a target, putty exercises, or any board game that interests the student. The type of break offered would reflect the student’s needs at that time, taking into consideration whether a fine-motor, vision, or simple “fun” activity would best suit his or her needs. 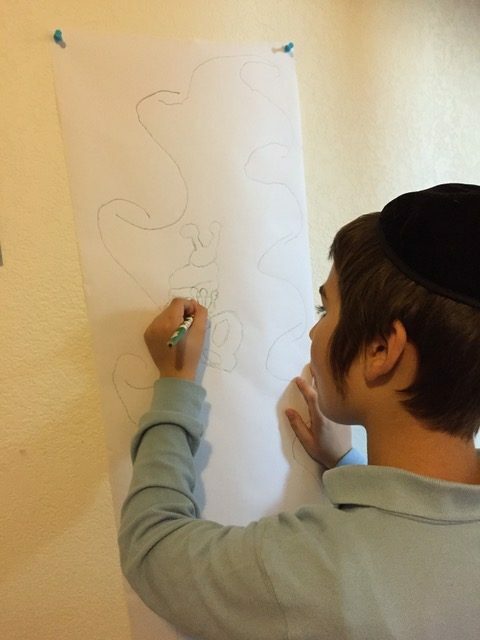 An important note: During the vertical activities, the students should have their wrists and forearms in light contact with the wall and paper, allowing them to glide across the paper with a fluid movement as they perform the task. (Be sure to attend to the non-dominant hand, as well, ensuring that it is placed appropriately on the wall and paper.) To help with the correct positioning, I may add a very light weighted wrist band on each wrist, draw a highlighted line where their wrist should maintain contact, and/or place light pressure on their wrists with my index finger to guide and remind them. It takes time – lots sometimes – so be patient. *And it is also important to avoid using markers or pens for these initial stages. 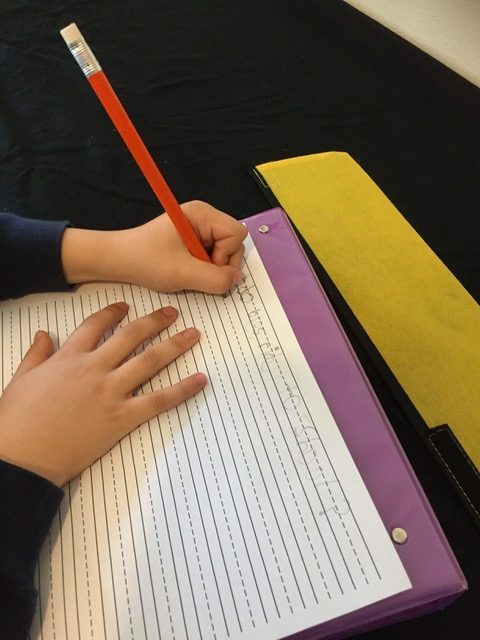 Pencils provide important tactile feedback that gives the student an increased awareness of his or her hand placement using the appropriate writing tool, of a sense of pressure on the pencil, and a feel for the movement of the hand. and the fine-motor in different sessions. For example, on Monday I’d do the fine-motor first, then go on to the vertical. Then on Wednesday, I’d begin with vertical and then move on to fine-motor, increasing the amount gradually relative to the fatigue levels. The reason I do this is because it makes it easier for me to assess the fine motor before and after using those muscles in the vertical position. Then, when the fine-motor is improving, then I might keep that portion for after the vertical. It sounds like that is contrary to the way we typically conduct a session, and it is. But in the case of floaters, we are mostly working on keeping the wrist and forearm in the appropriate positions. So, I alternate the order for the tasks to keep me informed about those particular needs. Sometimes, the student doesn’t really need much fine-motor strengthening. If he or she is not gripping the pencil too tightly or loosely, then the floating may simply be a case of upper body and core strength. At the end of the session, I would transfer the vertical task requirements to desk work, explaining that the same wrist positioning and movement applies to handwritten work performed at the desk. At first, it is best not to work on handwriting in this portion of the session. Bring down the drawings, doodling, or coloring activities that the student was working on and have him or her practice on those. This eliminates the need for the student to monitor his or her handwriting quality. As the student progresses with the vertical activities, then handwriting can be introduced here in the final stages of the session. Now, I would most definitely check sensory skills. Sometimes students simply don’t like the feeling of having the side of their hand moving across the paper. 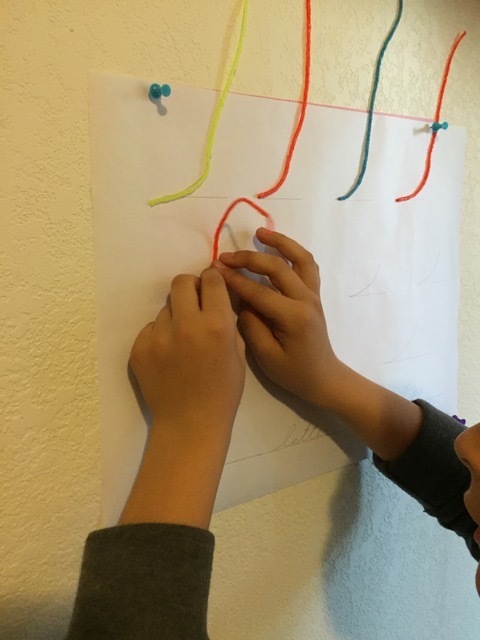 In that case (which I’ve only come across rarely in children without other sensory needs), I begin their work on the vertical surface by adding a piece of felt or soft cloth layered on the bottom portion of the paper. This provides a “gentler” surface that allows them to move their hands over that portion of the paper. I gradually remove the amount of time this strategy is included in the task. If they don’t like smooth surfaces, then I would put a fabric such as a softer burlap there that will provide some texture and scratchiness to the surface. These are my tried and true suggestions. But, I’m sure that you have your own strategies that have worked for you and your students. Please share them with us so that we can all learn from your experiences. Pictures above are the property of the author and their just must provide a link back to this article or her website. Use of the bubble wand picture should include a link back to the blog author. Helping students work on their handwriting development skills is fun and exciting! And there are so many cool games, gadgets, toys, and widgets out there to gather up and hoard in our OT Tool Boxes. Unfortunately, too much of a good thing leads to….well, too much of a good thing! It’s often necessary to weed out the extraneous (no matter how many you were able to buy at The Dollar Store!) and pick out the tools that will serve the needs of your diverse groups of children in the most efficient manner. Those are the gadgets and widgets that can be used in multiple ways to address a variety of developmental skills for children within a wide age range and who have many types of diagnoses. Yes, it can be done! My OT Tool Box has traveled with me from Maine to Maryland to Massachusetts and finally to Arizona. It has held basically the same items for all these years, beginning in the days when I was new to the pediatric scene until these times when I’ve got the thought of retirement tucked away in the peaceful, relaxing spot in my mind. I’m sure you have some type of box or bag that holds your treasured items, as well. I thought I’d share my must-haves in the hopes that you will share yours, too! Here goes! So, I’ve organized my tool box outline in the same manner. also provide a touch of vision challenges. Reaching, throwing, catching, kicking, and juggling are great ways to warm up the large muscles and to prepare the body’s core for fine motor work. These are the muscles that help children sit appropriately and quietly while they work on handwritten assignments. Yoga – can you beat it for covering just about every muscle group need there is? While balls and balloons provide action movements to wake up the muscles, yoga positions help the muscles pay attention to the commands directed at them. Sitting with appropriate posture requires both strong and coordinated muscles. And best yet, yoga is a double-duty activity. Performing yoga exercises at the beginning of a session helps to prepare the large muscles, as well as the brain, for the precision work ahead. Including yoga positions at the end of the session gives the large muscles time to reenergize with oxygen and provides the student with a cool down period before reentering the classroom. There are many free downloadable yoga charts on the internet with moves designed just for children. It’s important to choose ones that provide easy-to-understand directions in case you want to include them in the student’s home program. 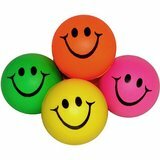 The Cotton Ball Game* has been a favored vision skill assessment and remediation tool for both me and my students for quite some time now. It’s a great way to warm up the eyes and the visual system for both close and distance work. Blowing on a straw addresses divergence, or the ability of the eyes to move outward simultaneously and focus together on an object in the distance to produce a single picture. This skill is especially helpful during copying-from-the board activities. Convergence, or the ability of the eyes to move inward simultaneously during close work, is addressed by sucking on a straw. 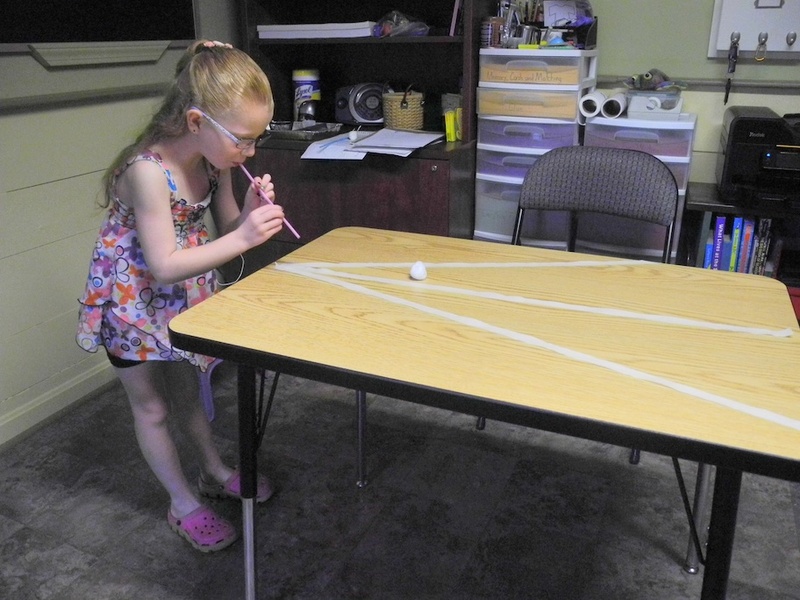 Just a cotton ball or two and a few straws can be magically turned into target or carry games that address these important vision skills. 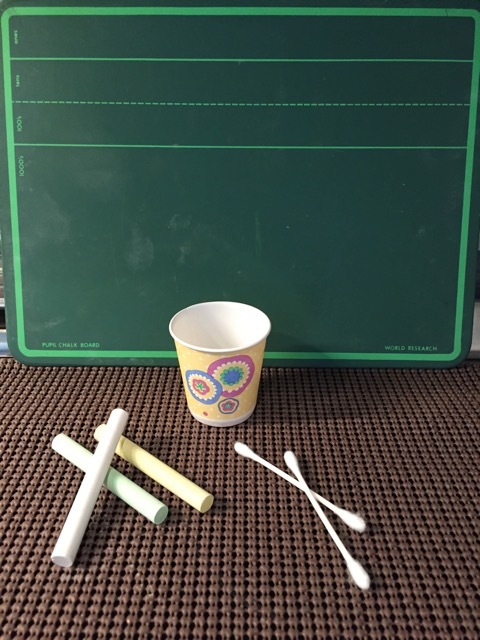 Have your students create and produce a target as part of their fine-motor work and then use it in the next session to warm up their eyes in the Cotton Ball Game. 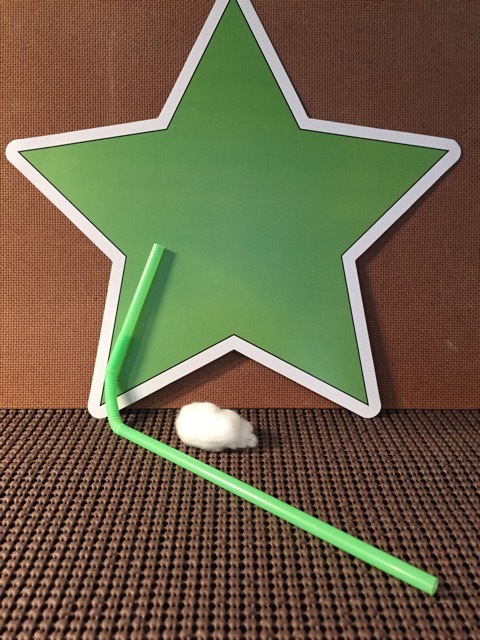 They can move the cotton ball along a track (created with masking tape) by blowing through the straw or carry it across the table toward the target by sucking on the straw to keep it stuck there. Your students will love creating the track on the floor or a table, making intricate maze designs that will challenge their vision skills. 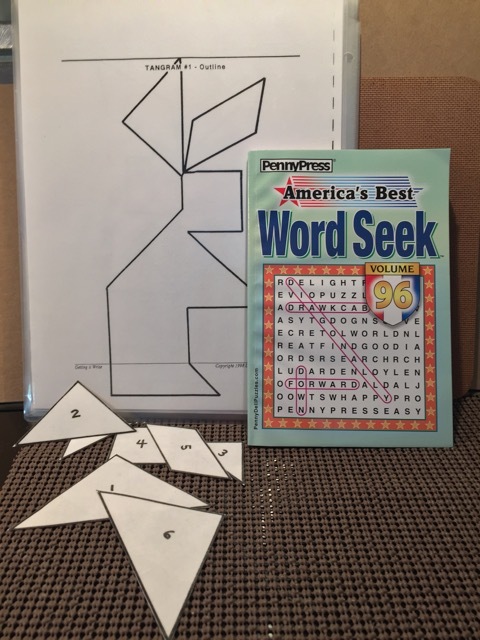 Word Search Books (or free downloadable puzzles) come in very handy for vision skill warm-ups. It is important to prepare the eyes for fine motor work, especially scanning and tracking, to set the students up for achieving their personal best in your session. These activities also serve double-duty as they can be included in your visual perception portion of the session! If they are not completely finished during the session, they are simple to include in the students’ home programs. Tangrams work on visual closure, visual discrimination, and visual spatial relationships skills, while they enhance visual attention skills. Small playing cards are a dream tool to have on hand. Small ones help to develop fine motor skills and can work on so many visual-perceptual skills at the same time. They can be used for memory games such as Concentration, where the cards are placed face down and then two are turned over to expose their faces. If they are not a match, then they are turned over again and the next person reveals two more. As the card faces are revealed, the object is to remember where you saw that one before and turn it over for a match! Concentration games are wonderfully fun ways to enhance visual memory, visual attention, and visual discrimination skills. My favorite small playing card game of all is The Number 10 Game! * A long time ago, I found a small card game called that in a dollar-type store in Canada. The cards had simple numbers on them from 1-10. I still have those cards, although they are pretty worn out. I wasn’t ever able to find the game again; so I use small playing cards now, removing the face cards and using just the number cards. The goal is to find all the matches that add up to 10. 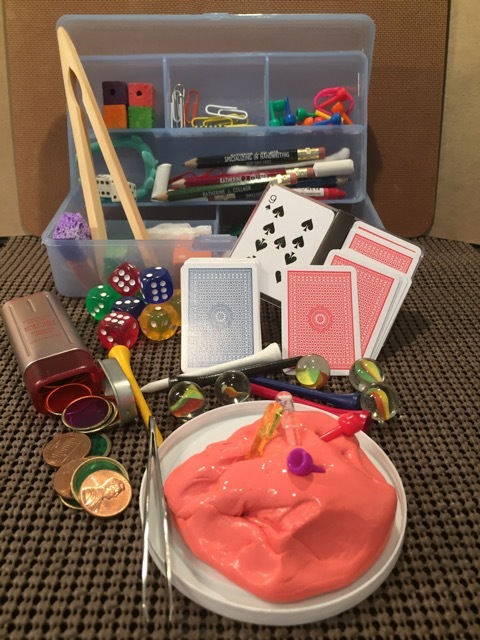 It’s simple to set up and a fun way to address both fine motor and visual-perceptual skills. First the cards are set up in 4 rows with 4 cards in a row. As the students make a match, those cards are put off to the side. 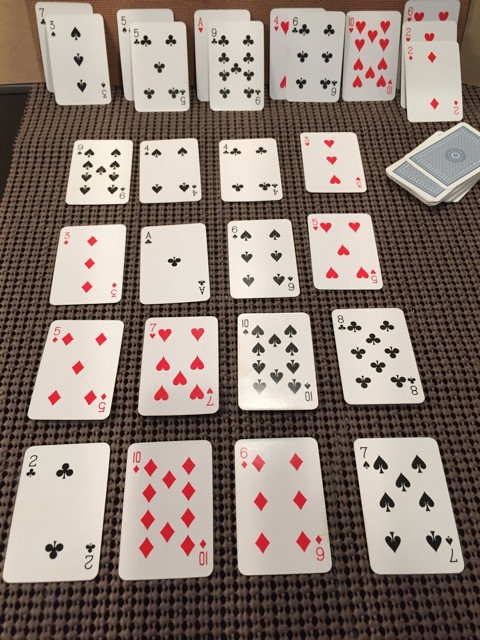 When there are no more matches in that set up, the removed cards are replaced to fill in the rows and the student continues to find more tens. You can decrease the number of rows depending on your students’ strengths and needs. If your students have difficulty with math concepts, post an addition chart by the table or next to the game so that they can reference it. However, if your students are proficient in their addition skills, then you can set up the game as a race to beat their personal best. Of course, I’ve played it with them as a race; but most often the scales are tipped unfairly – with them beating me every time!!! Putty, Always Putty!!! Therapeutic putty maintains a permanent place of honor in my tool box. I don’t leave home without it. Pegs, golf tees, marbles, tweezers, and coins are staples that come along for the ride, giving my students a fine-motor workout while they play. 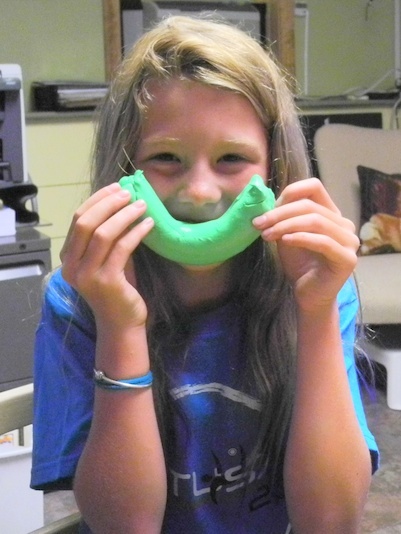 Both the younger and older students enjoy creating objects out of the putty, rolling it out again, and setting their creative juices to work on it once more. I do have a set of putty exercises* we work on, too, which often becomes part of their home programs. For the more advanced students, I bring along clay especially for them so that they can warm up their fingers before beginning handwriting tasks. My collection of fine-motor sundries make hand and finger warm-ups fun. Small sponge pieces, blocks, paper clips, and pegs match up with tweezers and tongs to exercise the arches of the hand and the fingers and wrist. 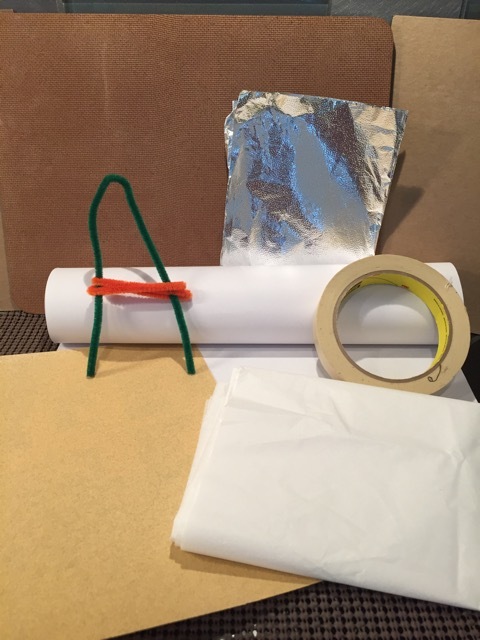 These pieces can be combined to outline the directional concepts of a letter formation, to place along the pathway of a maze, or to stack and create an object. Pickup Sticks work the pincer grasp, shoulder and arm control, and visual attention and figure-ground discrimination skills. Patience and critical thinking are added bonus skills that are touched on in this game! Dice are wonderful tools to enhance in-hand manipulation skills. They can be used during board games or activities that you design to address the handwriting development skills your students are working on. For instance, you can play BINGO with them using the numbers they roll to determine what the students will write in the boxes. In the example below, the die is rolled twice. 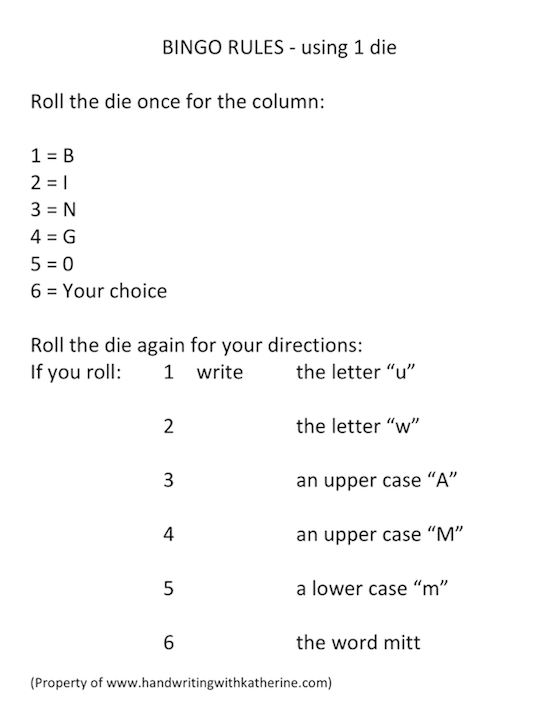 With the first roll, a 1 would indicate that the student would write a lower case “u.” With the second roll, a 4 would indicate that the student would write that letter in the first box in the “G” column. I always play along with the student so that we could compete to win. The game would continue until the first person had BINGO! I’ve also used dice with the small playing cards, changing the Number 10 Game rules just a bit. After the cards are set up, the student rolls the dice and selects the cards that add up to that number. When all of those matches are made and the rows are filled in with additional cards again, the student rolls the dice again for a new number. This adds to the suspense! I always carry a supply of postcards, sticky notes, children’s stationery, and lined and blank paper with me. The blank paper comes in handy for the younger children to draw a picture and then write a short story on handwriting paper describing what their picture shows me. The older children can draw a directional map to guide me to their favorite place in town or a room diagram to show me what their living room or classroom looks like. They label the items in their best handwriting and then write directions to the place or a provide a description of it. To practice writing in small spaces, the students can write a postcard to a friend, their sister, or the teacher and hand deliver it; write the teacher or their parent a message on the sticky note; or write a recipe on an index card to share with me (they usually do this as part of their home program). Handwriting practice that doesn’t look like handwriting practice. The most functional tool in my tool box doesn’t actually come with me to the session. I often ask the students to bring in a homework or classwork assignment that addresses their particular handwriting need. They will bring in their worksheets that include small, unlined spaces; book reports that are not quite completed; or math and spelling sheets. These provide us with opportunities to work on spatial and editing skills, as well as discuss the areas that give them problems in class and at home. Well, I guess if you add up all of the individual pieces in my tool box, I wouldn’t be able to cash out in the “Around 15 items” checkout at the grocery store! But, all in all, these are the tools I have been carting around for years. I don’t know if they are the best ones; but I do know one thing. Whenever I get overly creative and start to stuff boxes of toys and equipment into my trunk and lug them into the session, the children and I most often revert back to the old standbys! And as always, thanks for reading and sharing my work! *These activities, and many more, are included as downloadable handouts in my Handwriting Development Assessment and Remediation book. Pictures are the property of the author and must provide a link back to this article or her website. If the photos are linked to another source, their use must provide a link to the originating source. Handwriting: You can take it personal. The goal of a handwriting instruction program is to guide the writer toward an efficient handwriting style that is both fluid and legible. Good penmanship is often defined by the level of proficiency the writer has achieved with the formations of letters, their proper placement on the lines and the paper, and the ability of the reader to interpret the intended message. But how important is good penmanship? In a review of Tamara Plakins Thornton’s book, Handwriting in America: A Cultural History, Dyas Lawson reveals the author’s interesting perspective of good penmanship. It seems that Ms. Thornton had a “secret conviction that good penmanship does not matter, that if anything it denotes a person who is fearful or incapable of being in any way unusual.” She goes on to say that the belief that one’s personality is reflected in his or her handwriting leads us to consider that a penmanship style that conflicts with the impression of “what teachers would call good handwriting,” one that conforms to the rules and looks like the formations printed in the instruction workbooks, would be the “mark of individuality” (as cited in Lawson, n.d., para. 3). Yes, conformity is the standard of proficiency. An effective handwriting instruction program demands a regimented curriculum and can indeed appear to be conducted in a “militaristic” fashion, as Lawson described the A. N. Palmer methods teachers used in their classes. Lawson concedes, however, that although their practice began with the “issuing [of] commands: ‘Pens. Position. Circles’,” the teacher did “get results” (Lawson, n.d., para. 5). I have always considered the process of learning and mastering the skill to write letters to lead to the discovery of a comfortable and personalized handwriting style with which to convey thoughts, feelings, and knowledge efficiently. It seems strange somehow that an adult’s use of an individualized, nonconforming form of expression should be considered a weakness when it should be treated as a strength, a culmination of the years of practice and use of a handwriting style. If it’s legible, I consider it to be good penmanship. Why are we still judged by our handwriting? Perhaps the evolution of handwriting, the various places it has held in society, and its transition into a formal mode of communication has set the stage for this all-or-nothing standard for proficiency. The birth of writing. Not long ago, formal penmanship instruction was considered to be a valuable school subject, one that was taught with as much rigor as reading, math, and science. But long before the introduction of standardized forms of handwriting that would serve as communication tools in every facet of life, cultures were concerned more about the basic need to exchange information to document their norms and histories. The earliest known form of communication presented in what we now call writing may have been cave paintings called pictographs and petroglyphs (paintings and incised pictures on stone, respectively) (Introduction to the History, n.d.). Sumerian cuneiform, written with a reed stylus, and Egyptian hieroglyphics, carved in stone or painted on papyrus, as well as early Kanji Chinese letter forms, are considered to be the origins of writing, providing people with “a codified system of standard symbols: the repetition of agreed-upon simple shapes to represent ideas” (History of Handwriting, n.d., p. 1). The pictographs and ideographs (a combination of pictographs used to represent ideas) used in these methods of writing provided people within those cultures an opportunity to record their thoughts and creative ideas, as well as document their histories, discoveries, and theories (History of Handwriting, n.d. p. 1) But not just any people. These methods were specialized tools for communication comprised of many signs that took scribes years to master. Originally, hieroglyphics were used to present religious writings and scribes were valued and highly respected, ranking at the top of the social chart. Only those families with money could send their boys to school to learn this skill and those who were chosen to perform this task did not pay taxes, have to perform any military duties, or do manual labor. (Egyptian Scribes, n.d., para. 2) During the period before the invention of the printing press, handwriting skills were considered valuable rights that could enhance your life and prevent you from being “sent out into the fields to mow hay or to plow” (Saba, 2011, para. 6). Scribes dedicated their lives to produce books and manuscripts in monasteries and it is thought that each monastery had its own style of handwriting (Saba, 2011). Arnie Sanders, an associate professor of English at Goucher College in Baltimore, reveals that “The real purpose of writing was to propagate the word of God, and to regulate the worship of God. That’s what kept handwriting alive, and why it was taught as a vocation” (as cited in Saba, 2011, para. 8). As writing continued to maintain its status as an important religious documentation tool, it is felt that the demand of a more expeditious and legible script most likely led to the creation of the alphabet (Introduction to the History, n.d.). The journey of the alphabet. The Phoenicians developed a 22-letter phonetically-based alphabet that translated “ideographic writing to phonetic writing” (Introduction to the History, n.d., p. 8). This spread to Greece, where it was transformed into an alphabet using 24 letters, including vowels. This was later adopted by the Romans, who used 23 letter forms and additional consonants. This alphabet consisted of only capital letters, with a more informal script developed later that “was the earliest sign of lowercase letter forms, with ascenders, descenders and ligatures between the letters” (History of Handwriting, n.d., p. 3) and would be used to record transactions and conduct correspondence. The invention of the printing press and the creation of the “very delicate type faces with many flourishes and curliques in [their] script-like letters” (History of Handwriting, n.d., p. 4) resulted in the production of aesthetic looking documents. The desire to emulate this style of print elevated the advantages of having an elegant handwriting style. Those who possessed one enjoyed a higher social status. It is felt that “it took the printing press to create a notion of handwriting as a sign of self,” (Atrubek, 2009, p. 3) slowly becoming a “form of self-expression when it ceased to be the primary mode of written communication.” (p. 4). You are your handwriting. At this point, handwriting had remained a somewhat personal skill, following prescribed alphabets but allowing for its presentation to be more class-based rather than conforming to a standardized format. Clerks, engravers, ladies, and gentlemen all produced handwriting styles that pointed to their individual stations in life. During Colonial times, a handwritten document could readily identify the writer’s “social status, educational level, and relative importance in society” (Lawson, n.d., para. 8) And although prominent figures in society, such as Benjamin Franklin, strongly supported good penmanship, only wealthy men were afforded the opportunity to learn it. Encyclopedias and books included entries to illustrate appropriate writing equipment and grip, as well as the proper seated posture for writing (Makala, 2013, p. 8), and reference volumes were printed to educate clerks or tradesmen on the written transactions used in business (p. 10). When training was finally offered to educate teachers as well as the general public on handwriting styles, it is evident that penmanship was considered a valuable and economically viable skill to sell. Documentation recorded in 1849 indicates that “100 writing academies [were registered] in New Hampshire and 272 in Rhode Island” (Kaminski, n.d., (section “Understanding Edison’s Writing”). Enter Mr. Spencer. By the mid-19th century, those interested in developing an efficient handwriting system turned to a combination of the methods described above, with an emphasis on forearm movement included in the teaching of letter formations. Platt Rogers Spencer, considered by some to be “the father of American handwriting,” (Atrubek, 2009, p. 3) designed what would become “the first accepted American standard for learning penmanship” (Introduction to the History, n.d., p. 22). He built a chain of business schools to teach his script, believing that its mastery would “make someone refined, genteel, upstanding” (Handwriting is History, p. 3). The Spencerian method was a form of cursive that included “ornate and sinuous” strokes (Cohen, 2012, para. 3) and was quickly adopted by schools and businesses. Spencerian script was introduced and taught in schools from the 1860s to the 1920s (Handwriting is History, n.d.). Also during this time, the creation of a public school grading system led to the creation of handwriting books designed to fit the developmental needs of the students in each grade (Doughtery, 1917). At this time, some handwriting masters thought that “vertical writing,” or one produced without a slant, would be a preferable style “based on superior hygienic conditions” (Doughtery, 1917, p. 283). I’m not quite clear about what Doughtery was referring to here; but I’m assuming that vertical writing produced in conjunction with vertical paper placement may have been felt to be more conducive to maintaining an upright body position to facilitate posture and to reduce eyestrain, for the author notes that neither of these were remedied by this handwriting practice. She further notes that vertical writing “was found to be inefficient from the viewpoint of speed and legibility and so was abandoned” (p. 283) at the end of the 19th century. “As typewriting had mechanized office communication, Palmer turned individual writers into machines – the social importance ascribed to handwriting had again transmogrified from an integral indicator of character to a disconnected musculoskeletal function” (p. 5). Lawson does concede, however, that Palmer did provide an efficient handwriting style that was uniform and legible. The Palmer method was the “dominant tradition in American handwriting instruction from the 1890’s,” (Makala, 2013, p. 14) finally being unseated as the favored program in the mid-twentieth century. At that time, educators felt it was more advantageous to teach manuscript first to initiate children into writing instruction sooner, followed by cursive when manuscript was mastered (Atrubek, 2009; Makala, 2013). But what does all of this history tell us about the relative importance of good penmanship and the relevance of an individual style of handwriting that defines us as a person and conveys our message in a way that no one else can? What does Thornton’s conviction in her 1996 book say about the insidious decline of handwriting instruction – or the importance of it – in our schools, where once it was considered so very important that children stood at chalkboards day after day learning to master Palmer’s plain and rapid strokes? 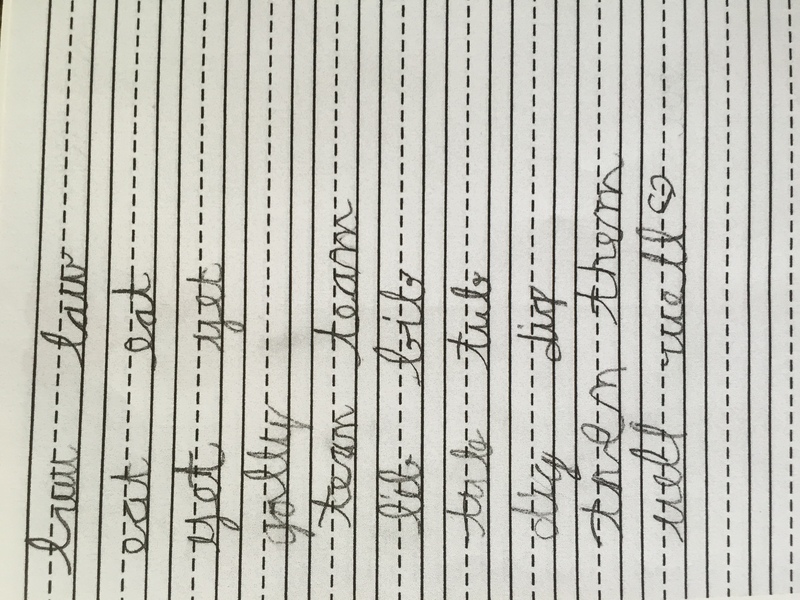 What does the need for constant reaffirmation about the influence of learning handwriting formations on literacy development say about a culture that has prided itself as a leader in education, job growth, and innovation? When at one point, we felt handwriting proficiency was so important that scribes dedicated their lives to learning it, when only the wealthy were afforded the skill, and when your handwriting could identify your station in society. When, at a time not so long ago, those who valued handwriting feared that the typewriter threatened to take away the intimacy of self-expression that a handwritten document represented. Was Thornton correct? Is handwriting proficiency simply a way to shackle us to conformity? Or is it a learning tool that guides us to literacy? And a personalized mark that we leave as our legacy?